How Can You Get Your Website Noticed? It's up to you to make it easy for search engines to serve up your site when prospects go searching. 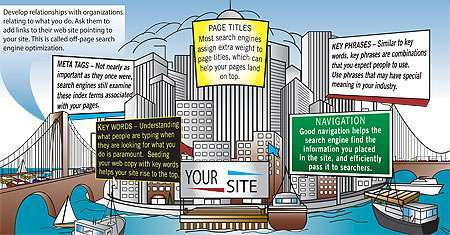 How exactly do you use search engine optimization? You can use visual stories to convey your message but even when you have a message, how will your prospects find you? One way that business people find goods and services is to search the web. It’s up to you to optimize your site to make it easy for search engines to serve up your site when prospects go searching. You can get your website noticed through search engine optimization. Think you can get people to contact you by just writing about your new technology, great ideas, or by giving away white papers? If what you do is new, what makes you think prospects are searching for it? Rather, consider what prospects are thinking, and typing, when they are in a frame of mind to care about what you offer. You need a strategy. Otherwise, your site will become just one more dark corner on the Internet. Now that you’ve got a website with great marketing content, how is anyone going to find it? What exactly are your prospects searching for? How can you get search engines to show links to your website in the first few results pages? Find out how you can get ahead of your competitors in search results. Getting noticed on the web takes know-how, and work. The fifty-cent term for it is Search Engine Optimization, or SEO. Your competitors may not be using SEO, which presents you with an opportunity for competitive advantage. This article gives you a few tips to help your site be found before competitors’, the first step if your web site is going to generate sales leads. You need execution. Structuring pages and documents correctly, eliminating common mistakes and getting links on related sites is all part of a managed lead-generation program that includes search engine optimization. Learn How to Get Your Website Noticed! Develop relationships with organizations relating to what you do. Ask them to add links pointing to your site. This is called off-page search engine optimization. Find out what words and phrases your prospects are searching for, and use them liberally throughout your site. Keep in mind that the name or description of your product may be unknown to prospects. So do some research to find out what prospects are thinking before they know about you. This is called on-page search engine optimization. Understanding what people are typing when they are looking for what you do is paramount. Seeding your web copy with key words helps your site rise to the top. Similar to key words, key phrases are combinations that you expect people to use. Use phrases that may have special meaning in your industry. Not nearly as important as they once were, search engines still examine these index terms associated with your pages. Most search engines assign extra weight to page titles, which can help your pages land on top. Good navigation helps the search engine find the information you placed in the site, and efficiently pass it to searchers. Effective use of search engine optimization can greatly enhance the performance of your sales and marketing process, and provide you a competitive advantage. Better lead generation, in turn, also means an improved sales and marketing pipeline. For a deeper understanding of process improvement programs for your organization, attend the next Implementing Lean Thinking class. Can Maintaining Procedures Stall Company Growth?